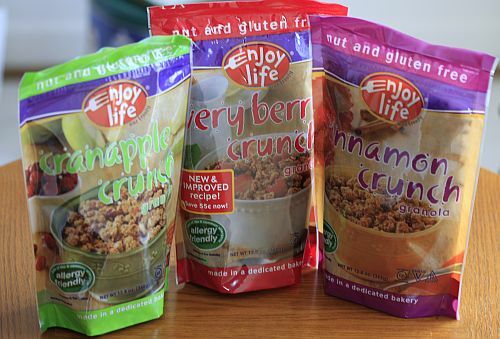 Last week I received three packs of granola from Enjoy Life Foods. They specialize in allergen free food products like granola, snack bars, bagels, cookies, chocolate chips and chocolate bars to name a few. Their product contains no wheat, dairy, peanuts, tree nuts, egg, soy, fish or shellfish (the 8 common allergens). The product under review is their nut and gluten free granola; 1) Very Berry Crunch, 2) Cranapple Crunch and 3) Cinnamon Crunch. The pack claims that the granola is made in a dedicated nut and gluten free bakery. I also see that it is certified gluten free and vegan. Reading the nutrition label and ingredients list, I gather that it is low in fat, has no saturated and trans fat, has less sugar (Refined white sugar is not used. 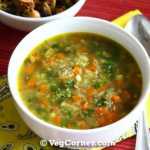 Instead brown rice syrup, evaporated cane juice and honey is used. Also the dried fruits lend its natural sweetness to the granola). The main ingredient is brown rice flakes. 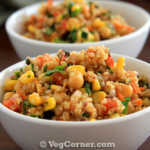 Each serving also contains 17-18gm whole grain. The serving size listed is 1/2 cup (52g). I compared a couple of other granola products in the market and found that 1/4 cup serving has as much calories, carbohydrates, sugar and much more fat than 1/2 cup serving of Enjoy Life Foods’ granola. So I’m pretty sure this one is healthy as well. I think all three have 3 WW POINTS value per 1/2 cup serving. (I calculated it myself from the Weight Watchers’ guide, not listed in the pack). Now coming to the important factor, TASTE! How did it fare? Like many others, I’m also a proud mother of a very picky eater. So I thought, who is better than my son to test it! He is a kind of a guy who loves the presentation more than the actual stuff. If I bake a cookie or a bar he does not eat it, but if it comes in a colorful wrapper he loves it. So he was very excited to see the colorful packs of granola. He wanted to try little of each the same day. First he tried the green color pack (Cranapple Crunch). He continued eating after the first bite, which means it’s a winner! He also mentioned that he liked it. He wanted to taste the red color pack (Very Berry Crunch) next. That was a winner too and so was the violet color pack (Cinnamon Crunch). Now I cannot come to a conclusion based on one day because he usually does not like it the next day. So over the week I gave him (and he asked too) a couple of times and ate it without any complaints. Now I can really declare that it’s a winner! As for me, I liked the Cranapple Crunch and Very Berry Crunch than Cinnamon Crunch because I’m not a cinnamon fan. All three were not very sweet unlike the regular granola. It was perfect for me. I was surprised to see that 1/2 cup serving had about 9-11 gms sugar because it did not feel sweet at all. I have tasted the Multi-grain Rice Krispies which has only 7gm sugar and it’s too sweet. Cranapple Crunch is sweet and sour. The tartness of dried cranberries balances the sweetness of the apple. 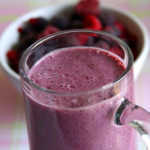 Very Berry Crunch contains small pieces of raspberries and strawberries. It’s mildly sweet and not as sour as the cranapple. The Cinnamon Crunch has raisins too. Since I had 3 packs of granola, I wanted to bake something with it. 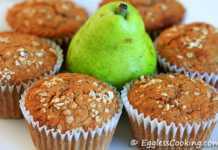 I searched the net for recipes using granola and decided to bake these granola muffins. I have made some changes to the original recipe. Note that these muffins are not nut free and gluten free. It’s egg free though! I used the Cinnamon Crunch granola for these muffins. The original recipe had ground cinnamon, I have omitted that. 15 Mins 20 Mins 12-16 Muffins. Preheat oven to 400F for 15 minutes. Grease the muffin tin or line it with paper liner. If using a paper liner, after lining grease the liner by spraying with a non stick spray so the muffins will come out of the paper easily. Combine the dry ingredients together in a big bowl. From granola to baking soda. In another medium size bowl, whisk together the applesauce, milk, brown sugar, oil and yogurt. Add the wet ingredients to the flour mixture and mix until just combined. Divide evenly into prepared muffin tin, approximately 3 tablespoons of batter per muffin or 3/4th of the tin. Sprinkle little granola/oats on top. Let cool slightly in the tin and then remove to a cooling rack. Will I be baking it again? Definitely. I measured the applesauce using a dry measuring cup, not the liquid measuring mug. 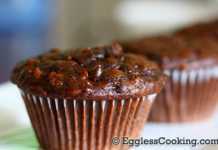 If you prefer sweet muffins, either use sweetened applesauce or increase the quantity of brown sugar to 1/2 cup. The original recipe did not use oat flour, I used it because I had it. So if you don’t have oat flour just use 1 cup of all purpose flour or in a food processor finely powder quick cooking oats. Walnuts and semi sweet chocolate chips were not mentioned in the recipe. I added it to lure my son to eat something healthy and it worked! The chocolate chips also gave the sweetness. Always try using mini chocolate chips because you can cut down on calories, sugar and fat. 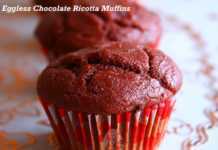 In place of using 1 cup of chocolate chips, you can use just 1/2 cup of the mini without affecting the taste. I had some flavored yogurt (which we did not like by itself) so I used it instead of eggs. I used peach flavored yogurt. Also while using yogurt to replace eggs, instead of measuring exactly 1/4 cup of yogurt, use 3 tablespoons of yogurt and 1 tablespoon of water or any liquid. For this recipe I emptied directly two small containers of yogurt and while mixing felt that the muffin batter was very thick and then I had to add extra water, which made it very watery. I think this is the reason I had to bake it for around 26 minutes. So while using yogurt measure 3 tablespoons of yogurt and 1 tablespoon of water in a cup, whisk it well and then mix it to the other ingredients or simply use buttermilk. Next RecipeEgglessCooking.com on Fox News! Made these this morning using Bare Naked’s banana granola (as I had a bag on hand). Everything else exactly as on the recipe – delicious! Thank you for this great recipe! Will definitely make again. At 20 minutes it smelled fantastic! At 22 minutes I took it out of the oven, and it was just going to go towards dark brown. Did not burn, but next time, will take it out at exactly 20 minutes when I get enveloped in that wonderful aroma! These are great!!! My store had dark chocolate granola on an amazing sale so I used that and omitted brown sugar and oil – and I used 1 cup whole wheat flour and 2/3 cup ground oatmeal.- and I forgot the flaxseeds, but they are going in my next batch, I didn’t add walnuts, and since there are little bits of dark chocolate in the mix I didn’t add chips. I am passing around this recipe to some ladies at the gym!!! That is wonderful Dawn. Thanks for giving this recipe a try. Great way to use granola! !Just sent in my entry for low fat event. ooh yummy. 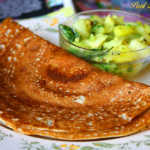 Perfect for breakfast with a cuppa coffee. 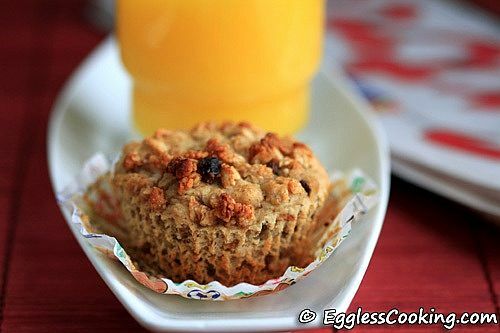 Loved the ideas of granola muffins, looks perfect ! They look too good with a slight crunch! Delicious, fabulous and healthy Granola muffins looks gorgeous Madhu..
Brita, thanks for sending me the packs. We did enjoy it. I am hands down ALL IN for this recipe! Sounds AMAZING!!! Those muffins look very tempting…Healthy too…. This is my first time too Nithya. Wow,I would prefer Cinnamon Crunch Madhu,I love cinnamon in all forms.The muffins are too mouthwatering with them.They look perfect but am surprised that they are not cinnamony? I have a doubt that the oat flour makes it denser?I am not sure thgh.Enjoy the muffins. I guessed so, when I saw your Cinnamon Coffee Cake. Since the recipe uses both whole wheat flour and oat flour I guess it was quite dense.